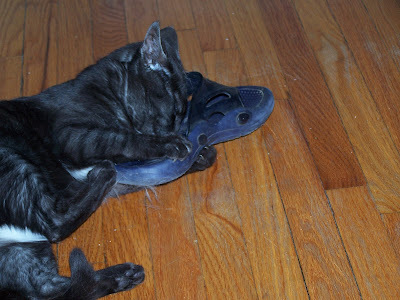 In the fine tradition of internet mourning, I post this picture of Rasmussen tearing into a sandal I got at a market in Puerto Escondido a few years back when he wasn't even a gleam in my eye. Now he is gone, and my wretched apartment is as empty as ever with only Rasmussen's useless litter box hanging around to remind me, and the occasional busted claw. Cat-owner's lesson learned: do not remove cat from house unless totally necessary. He most certainly had no desire to leave, I foolishly insisted and Rasmussen escaped en route to his home away-from-home to be, running into the night after my over-loaded bike trailer popped open on a darkened Brock Street over a rough patch of asphalt. I searched in vain for an hour, peering into little alleyways between houses with a bike light, to no avail. I think of him, in the chilling cold rains that have been coming down lately, and hope for the best. Although... not necessarily for Rasmussen, who is enjoying the ellusive freedom of an alley cat, as only a few of his brethren ever do. Perhaps he's even found himself a missus out there.